Looking for How to can your own homemade canned pickled garlic (complete directions with photos) in 2019? Scroll down this page and follow the links. And if you bring home some fruit or vegetables and want to can, freeze, make jam, salsa or pickles, see this page for simple, reliable, illustrated canning, freezing or preserving directions. There are plenty of other related resources, click on the resources dropdown above. I haven't got many photos for this recipe yet, but I'll work on that soon! 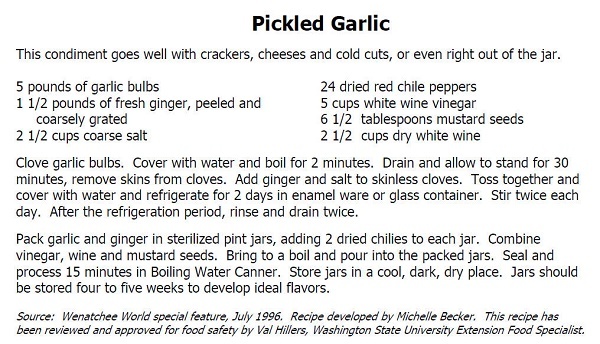 And for those who want a hot, spicy version; Washington State University has a recipe for pickled garlic with hot peppers here. That same page also has an onion relish recipe. And this page from University of California - Davis (UC Davis) has broad information about garlic preservation. The most important step! You need garlic that are FRESH and crisp. Remove and discard any soft, diseased, spotted and chewed up garlic. You can grow your own, pick your own, or buy them at the grocery store. If you want to make larger quantities, then about 12 pounds of garlic is typically makes about 5 quarts or 10 pints of pickled garlic. I wouldn't use canned garlic; what's the point: Most of the flavor is gone from them, and you can always get fresh garlic. Step 3 -Rinse the garlic! Remove the tough outer leaves. I'm sure you can figure out how to wash the garlic in plain cold or lukewarm water using your hands. Now see if you can wash the smell off your hands. Good luck in that. To soften and loosen skins, blanch garlic cloves in rapidly boiling water 30 seconds; immediately immerse in cold water, drain and peel cloves. Separate garlic bulbs into cloves. Add the peeled garlic cloves boil and gently 1 minute; remove from heat. Pack garlic into a hot jar to within 3/4 inch (2 cm) of top rim. Add the pickling solution solution (that they were cooked in) to cover garlic to within 1/2 inch (1 cm) of top rim (headspace). Using a nonmetallic utensil, remove air bubbles. 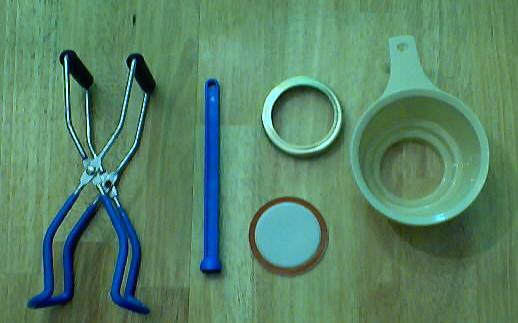 Wipe jar rim removing any stickiness. Put the lids on and do not overtighten. Place jar in canner; repeat for remaining garlic and hot liquid. At altitudes up to 1000 ft (305 m), process the filled jars for 35 minutes. Start timing when the water returns to a full boil. When processing time is complete, turn heat off and remove canner lid. 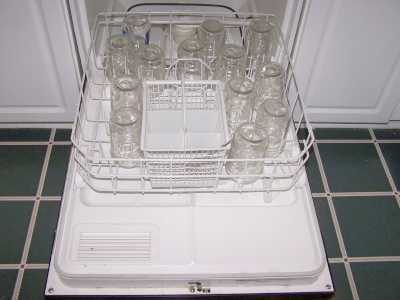 When boil subsides - bubbles no longer rise to surface (3 to 5 minutes) - remove jars without tilting. Cool jars upright, undisturbed 24 hours. DO NOT RETIGHTEN screw bands. Note: This recipe was specially formulated to allow home canners to preserve a low acid food - garlic - in commonly available boiling water canners. Do not deviate from the recipe ingredients, quantities, jar size and processing method and time. Any change could affect the safety of the end product. The chart below will help you determine the right processing time and pressure, if you have a different type of canner, or are above sea level. For most people, using a plain open water bath canner, the time will be 35 minutes. The Ball Blue book has a similar recipe that uses only 10 minutes, but I'll stick with the USDA's recommendation of 35 minutes for safety. 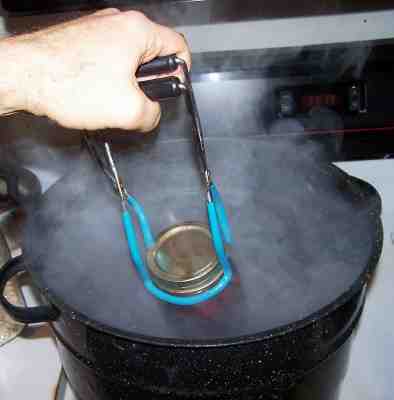 You can use either a plain water bath canner OR a pressure canner, since the vinegar adds so much acidity. Q. Why did the garlic cloves in my pickles turn green or bluish green? the garlic may naturally have more bluish pigment, and it is more evident after pickling. Immature bulbs should be cured two to four weeks at 70 ° F.
Q. Is it safe to can garlic in a traditional water bath? If so how long do you do process them? A. PICKLED garlic, Yes! The vinegar adds the needed acidity to make it safe. 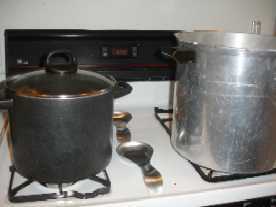 Several years ago, a recipe circulated using aspirin to acidify tomatoes and garlic for canning. Aspirin is not recommended for canning. While it contains salicylic acid, it does not sufficiently acidify tomatoes or garlic for safe hot water bath canning. garlic are low acid foods and may only be processed safely in a pressure canner. Lemon juice or vinegar is recommended to acidify tomato products for safe water bath processing.